Chop the onion,capsicum,carrot,cauliflower,green chillies finely. Add a pinch of hing,mustard and cumin seeds. Once they splutter add curry leaves. Add the chopped onions,green chillies,peanuts and veggies. Add salt and turmeric powder and cover and cook till the veggies get soft. 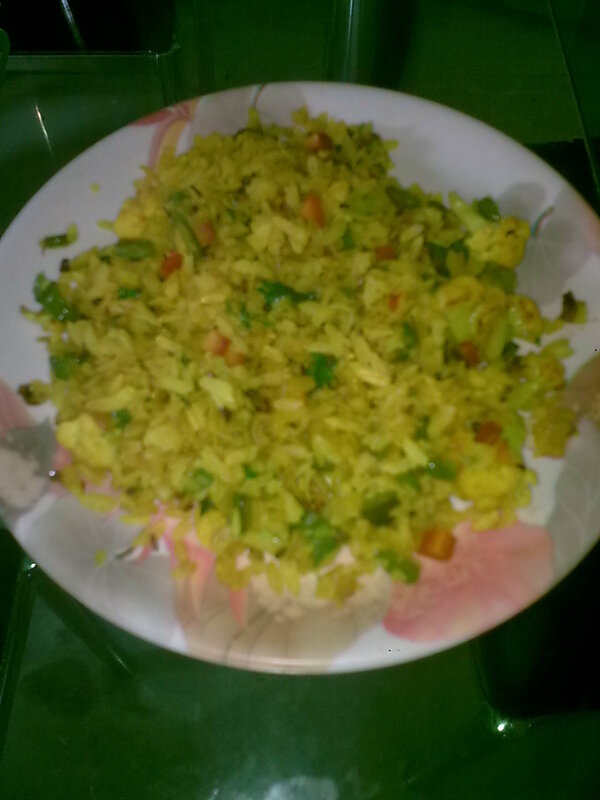 While the veggies are getting cooked wash the poha lightly once. This is important because as we are using thin poha,if you wash it more it will get mushy and form a lump.If it is thick poha then it can be washed a couple of times. Once the poha is ready(washed) add it to the pan. Add salt and sugar as per taste. Stir the poha lightly taking care not to break it. Garnish with fresh coriander leaves.Grated coconut can also be added at this time,I did not add.